The story begins with sixteen-year-old Jacob enduring a terrible family tragedy. 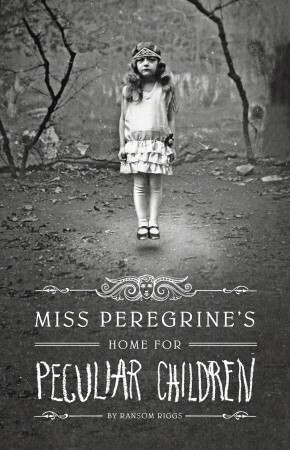 The tragedy then leads him to an island off the coast of Wales where he begins to explore Miss Peregrine's Home for Peculiar Children. He quickly finds out there is more than meets the eye in the old crumbling house. He enters a world of magic and discovers a family legacy that his grandfather had been trying to prepare him for all his life. How do you summarize this book without giving it all away? That's a tricky thing to do since it seems as though even the author had trouble with not giving it all away too soon. The book begins interestingly enough, but tends to become a little childish by the end. The word "silly" kept coming to mind while I was reading. There were just a few too many magical elements all jumbled together and not enough actual storyline to keep my attention. Then the story peaked about three quarters of the way through and I was ready to be done with it. With that said, there were a few things that make this book worth taking a look at. The concept of the book itself was enough to sell me on it. Incorporating the creepy vintage photographs into the book was a really novel idea. If I'm not mistaken, I believe the photographs were gathered first and then the story was written around them. Sadly, the story doesn't do them justice. Overall, Miss Peregrine's Home for Peculiar Children felt like a good idea that just sort of fizzled out.